It’s about that time DFW! 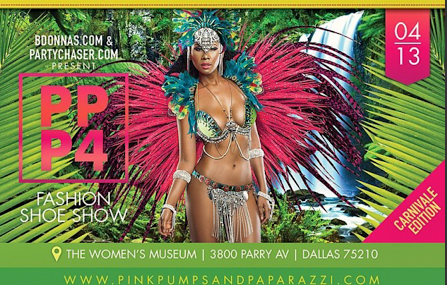 BDONNAS Pink Pumps and Paparazzi Shoe Fashion Show is bringing Dallas an extraordinary fashion show experience to the Dallas Women’s Museum April 13, 2014. Dallas Entertainment Journal’s own Ebony Jae’ had the opportunity to get a sneak peek behind the scenes. We were able to capture some of the models different personalities who will be featured rocking some of BDONNA’s exclusively vendors such as Lust for Life USA and Privileged Shoes. While behind the scenes with BDONNAS gearing up for the Pink Pumps and Paparazzi Shoe Fashion Show, Dallas Entertainment Journal saw first look at the BDONNAS Show room exclusively for VIP Clients and Celebrities. It was amazing as the Dallas Entertainment Journal got to capture first hand True Queens in action at the BDONNAS kingdom, the fierceness and passion in their eyes for the Pink Pumps and Paparazzi Shoe fashion show. It’s a don’t miss production! Pink Pumps and Paparazzi Shoe Fashion Show is brought to you by BDONNAS and PartyChaser.com April 13,2014 6:00pm-10:00pm Red carpet Style 3800 Parry AV Dallas, Texas 75210. Special guest include Angela Simmons, Rashidah “Rah Ali”, and Ming Lee. Hosted by: LeeAnne Locken (Big Rich Texas) Singers: Melodie Nicole and Shelby Show, sounds by Dallas own infamous DJ Duffey. Stay tuned by following @BDONNAS on Instagram and log onto www. PinkPumpsandPaparazzi.com to purchase your tickets. This will be one Epic Shoe Fashion Show you don’t want to miss, Dallas Entertainment Journal will be bringing you full coverage. From my lips to your ears, it’s your Host Dallas Entertainment Journal, Lips of Ebony ….. Follow us on Instagram at @DallasEntertainmentJournal and myself @lipsofebonyj you never know where we will be next!